Hi! My name is Dekaro, Giovanni Dekaro and I’m a video games tester. But I think life is not just games, so often I quit the job for travelling. 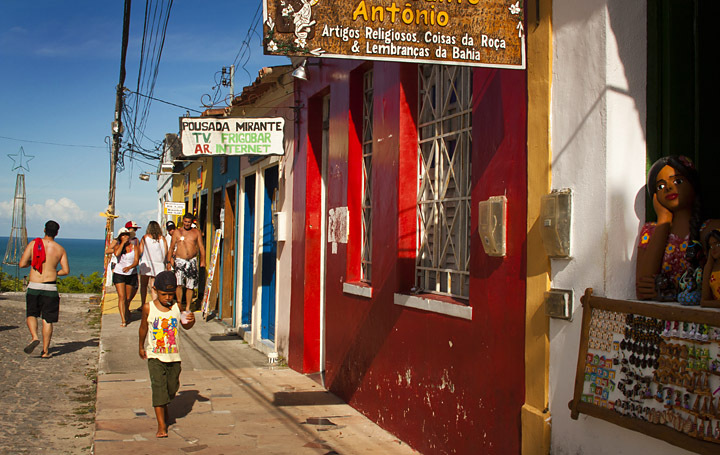 This time I have just started a journey in South and Central America, I’m in Brazil now, in a lovely little place called Arraial d’Ajuda, near Porto Seguro. 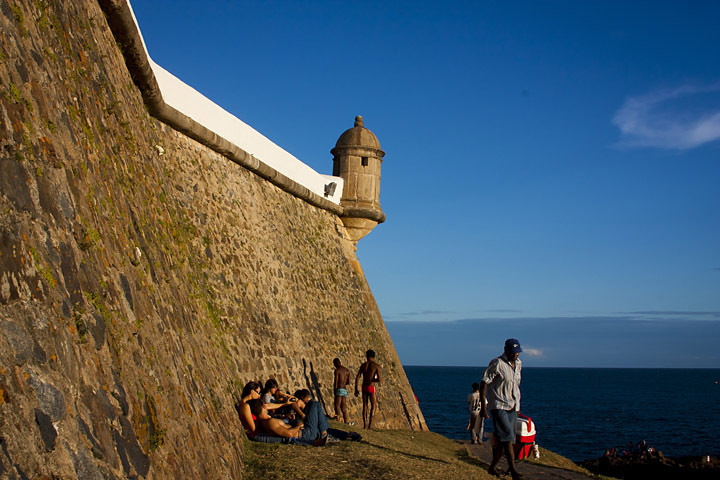 I landed 10 days ago in Salvador de Bahia. My plan is going north until the Amazon River, then, through it, arriving in Ecuador, then Colombia and finally all the little nations of Central America (Nicaragua, Costa Rica, etc…). 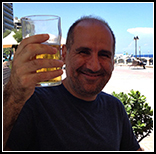 This is the English version of my Italian blog. I will write more in the Italian one because I still don’t feel much confidence with the English, but the photos will be the same. 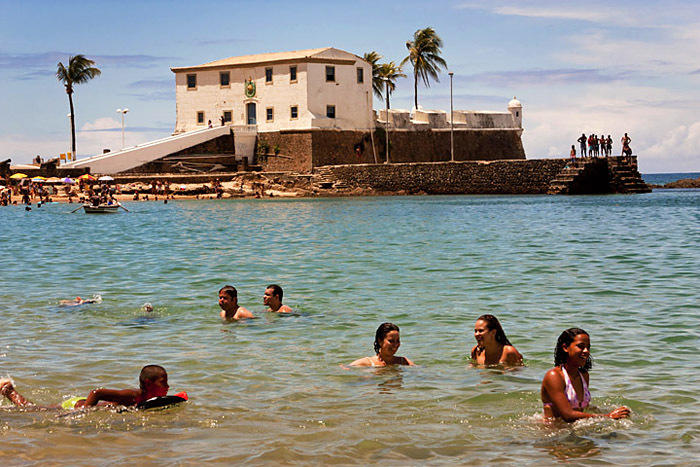 Salvador de Bahia, as almost all Brazil, is embraced by wonderful beaches. Here we are near Forte de Santa Maria, in the beach of Porto da Barra, the most famous of the city. 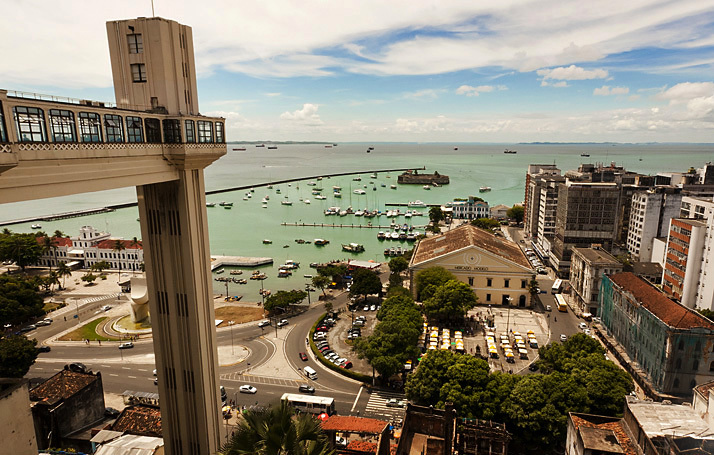 The elevator connecting the lower area of Barra with the upper area of Pelourinho, the historical center. 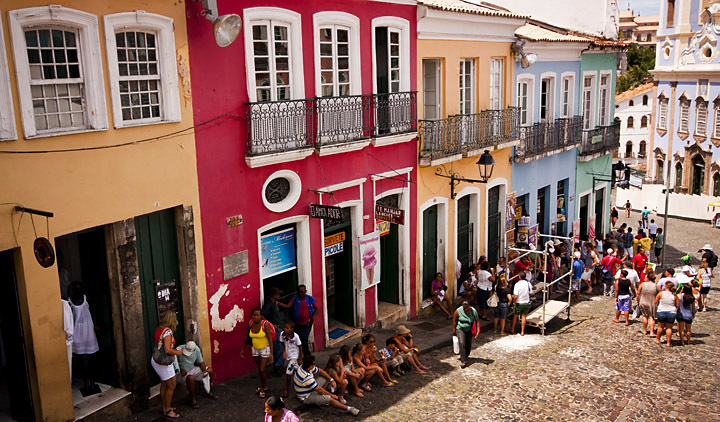 A typical street of Pelourinho, with cobblestones and painted houses. 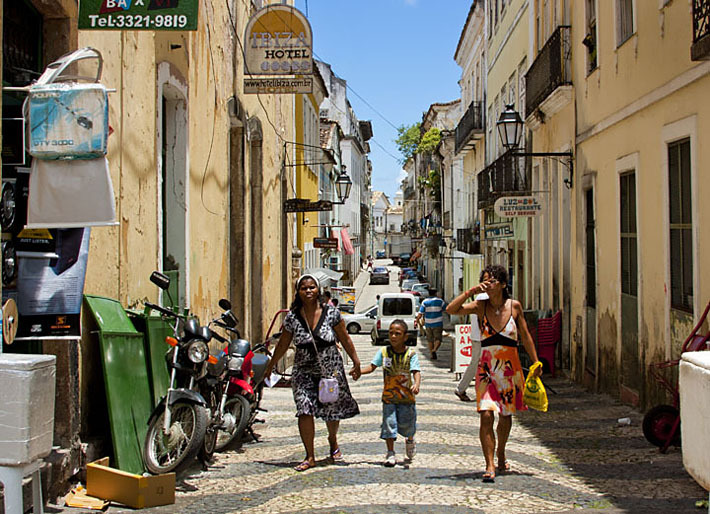 In this street I stayed the first time I was here in Salvador, in the Hotel Ibiza that, after I rented the room, I discovered was a kind of prostitute-hotel. But at the end was ok, and also the girls working there were always nice and good with me. 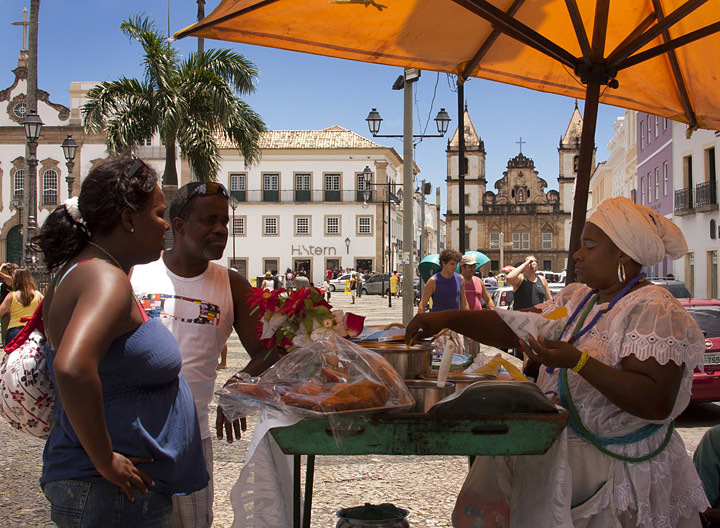 A bahian woman selling typical local food. 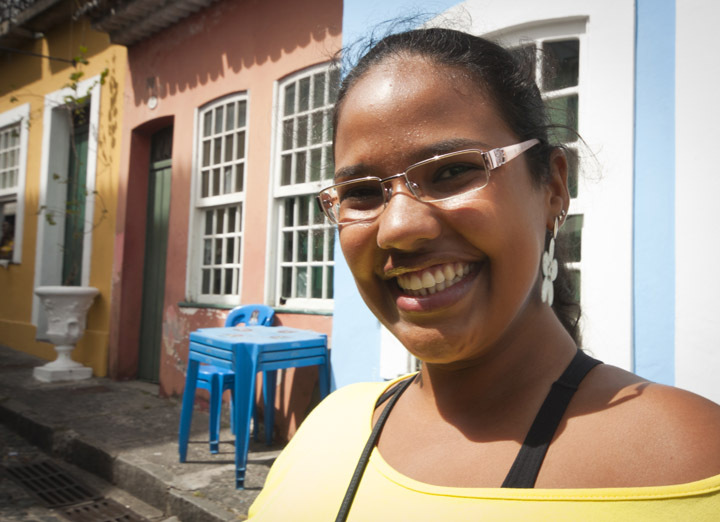 Gabriela is the first person I have met through Couchsurfing, a travellers network where I just registered. She is a very kind and gentle girl and explained to me a lot about the city. 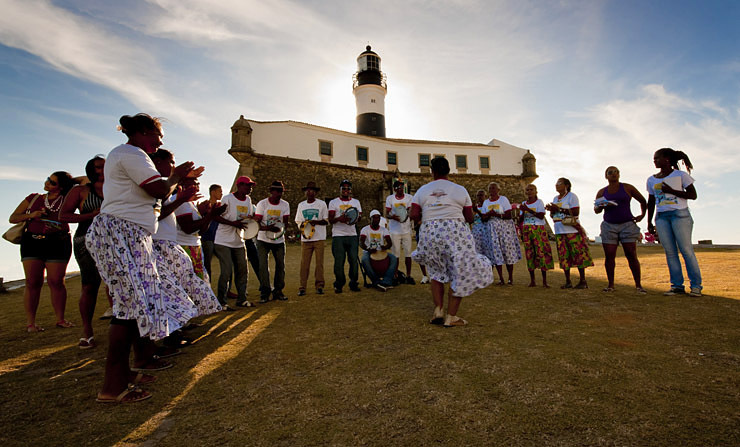 Playing and dancing under Farol da Barra, one of the symbol of the city. The original lighthouse (in wooden) was built in 1696, and was the first of the American continent. 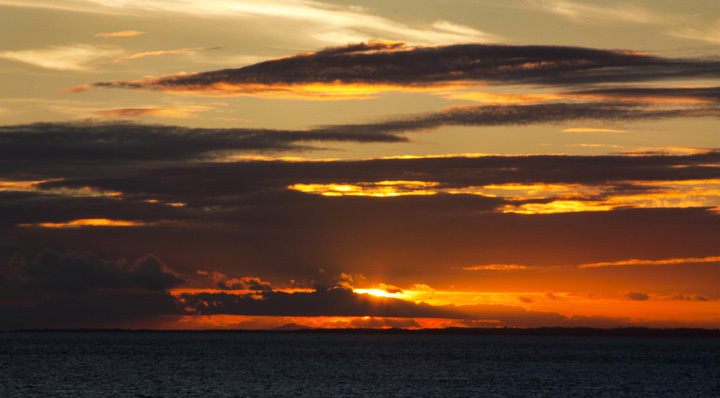 Just before sunset a lot of local people goes behind the lighthouse to watch it. Here we are in Arraial d’Ajuda, a small town that from the hill goes down to the sea. Some of its beaches are very beautiful, especially when walking south from the main one for about 20 minutes. Next time I will put some photos of them. 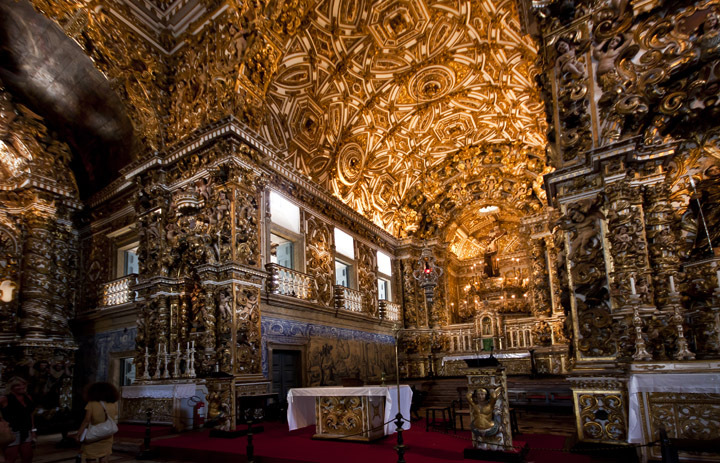 The church of Arraial d’Ajuda, built by Jesuit already in 1549, so a little more than half century after the “discovery” of America. 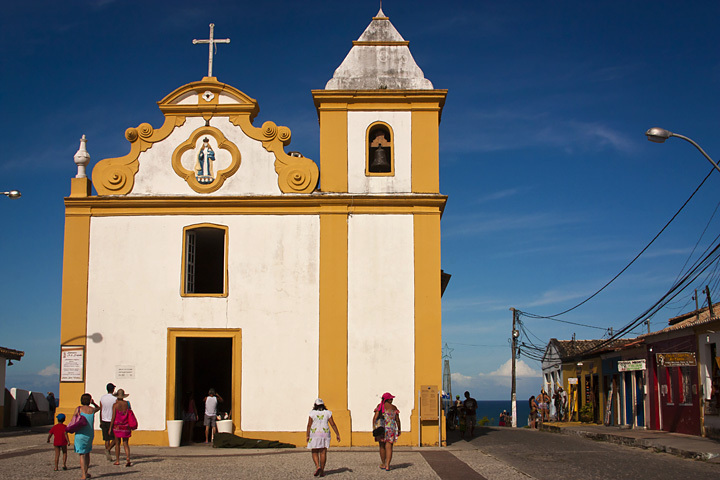 The near Porto Seguro is the place where the Portuguese arrived in 1500, starting the colonization of Brazil. 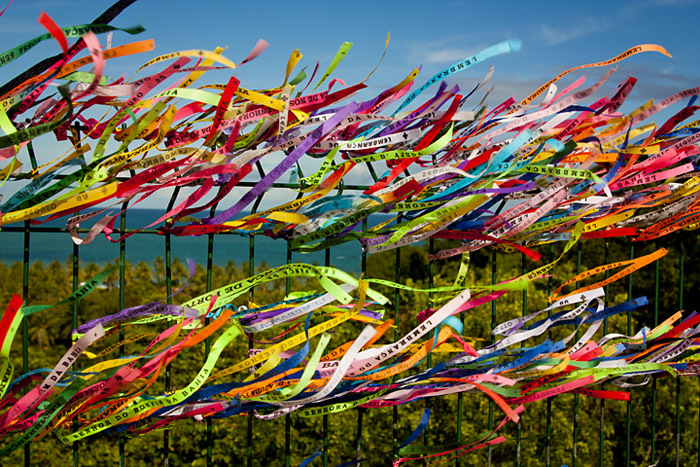 Wishes-ribbons attached on the grid behind the church. These ribbons can be brought also as bracelets. 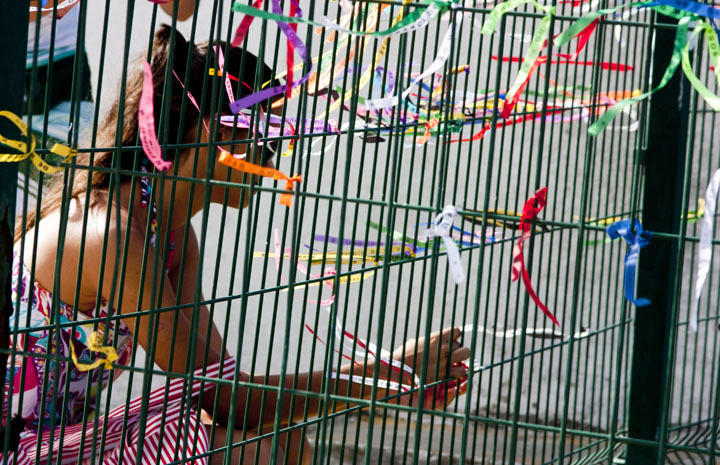 When they broke or untie (by themselves) the wish becomes true. A girl attaching a wish. And let’s hope it will come true. 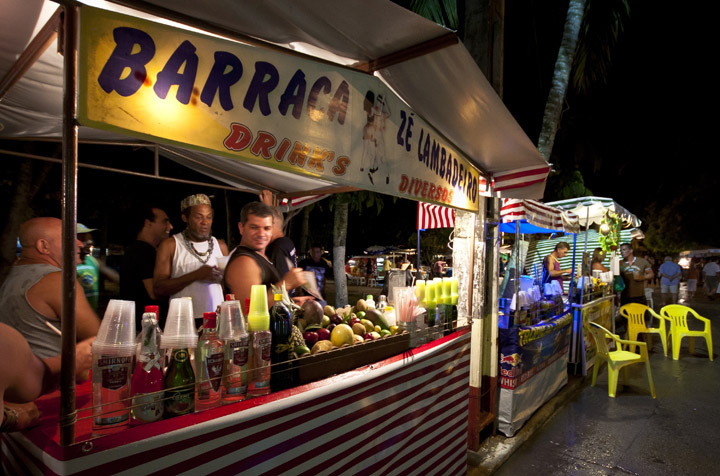 Stalls for cocktails with fresh fruit in the center of Arraial. 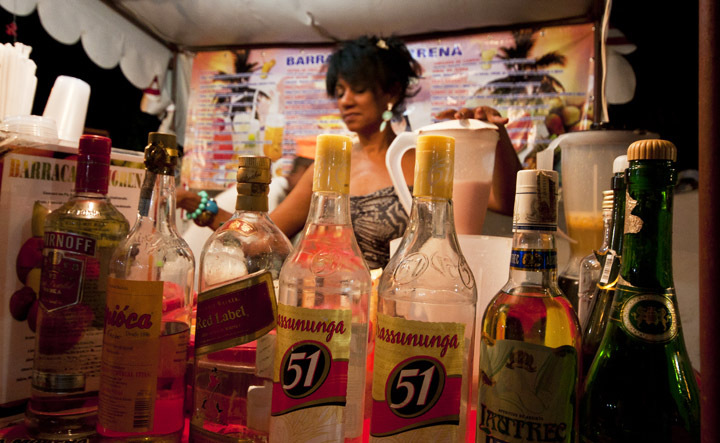 This is my preferred stall, with this magic woman creating delicious and very alcoholic cocktail using several different fruits and mixing them perfectly. Ok, that’s it for now. 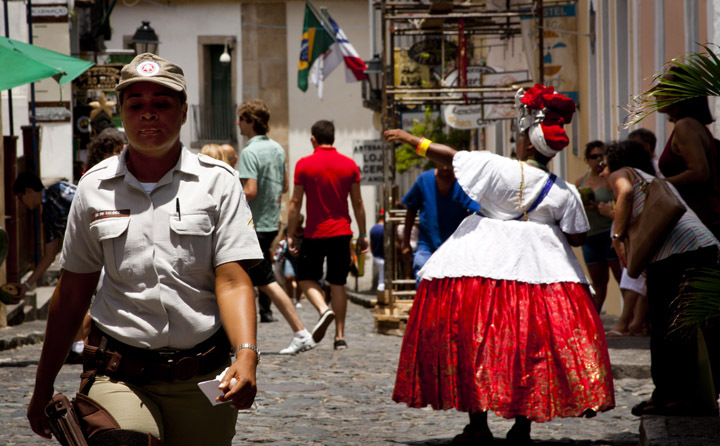 In two days I will be back again in Salavdor (a little north from here) and after, maybe, Recife. Follow me and, of course, all your comments are welcomed! 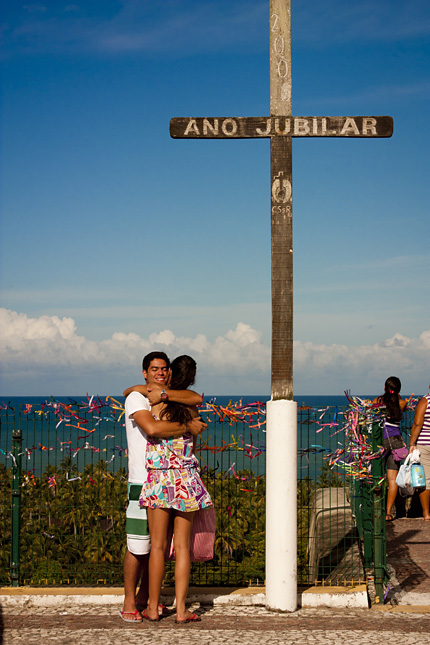 This entry was posted in brazil and tagged arraial d'ajuda, bahia, brazil, salvador by Dekaro. Bookmark the permalink.